Canning Tomato Sauce: Preparation - Get the Good Stuff! My kitchen smells like tomatoes. This is probably because approximately 125 lbs – 57 kg in metric – sprawls across my kitchen table in five glorious half-bushel bags. I fetched them from the grower this afternoon. I love that smell! The Annual Big Tomato Crush happens tomorrow. 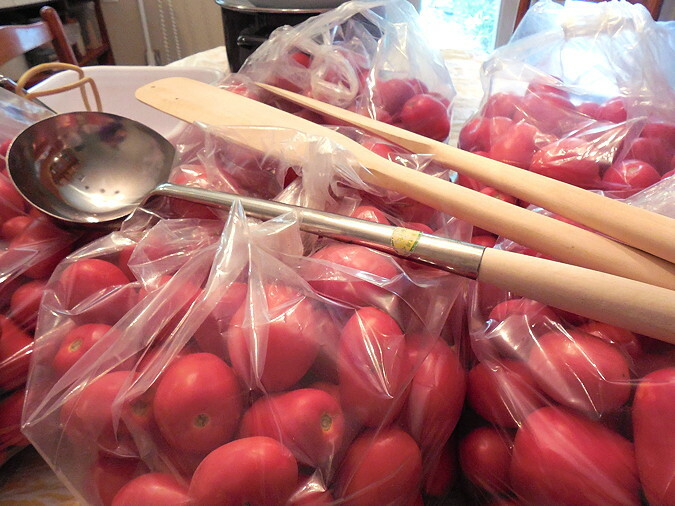 Last year we turned 1 1/2 bushels of Roma tomatoes into sauce – and we still ran out before the spring. This year we’re almost doubling the amount of tomatoes. We’re looking forward to using big propane burners (think turkey fryers) outside, where we will not be limited by the small stovetop, and where we won’t be heating up the house. So we’re turning this into a party. Let’s see, what’s on my prep list? arrange canning tools: jar lifters, baskets, wire racks, trivets, etc. Watch for photos and thoughts on how to set up for next time soon to come. And remember, you don’t have to put up mass quantities every time you can – but when you do, have fun with it! Spiced Tomato Jam - Get the Good Stuff! Spiced Tomato Jam | Get the Good Stuff!